This chapter analyzes the effects of the school regulations in the organization of the elementary education in Spain in 1845–1850. 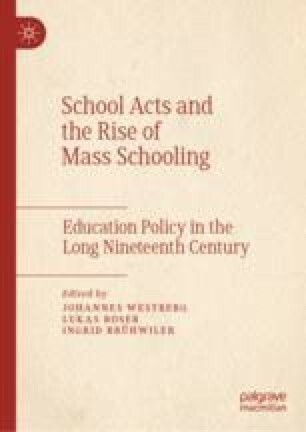 The aim is to disentangle to what extent the implementation of the Someruelos Act and Montesino Regulations of 1838 modernized the nineteenth-century Spanish education and universalized primary education. Data from the Madoz Dictionary of 1845–1850 are used to analyze the effects of the educational regulations of 1838 on the supply of elementary primary education in Spain. “Anuario Estadístico de España 1858.” Accessed November 1, 2018, http://www.ine.es/inebaseweb/treeNavigation.do?tn=191992&tns=191979#191979.